Recently one of our maintenance customers sold their home and moved to Beverly Hills to be close to her mother, well of course there was not a pond there, so I was invited out to take a look at where they wanted to build a pond. What was most important to them, was that the pond looked like it had been there all along, that the pond was deep enough so that there would not be a problem with raccoon’s or large birds preying on their fish and that maintenance of the pond was easy. So we came up with a plan and this is what we did for them. First of all we built the pond 3-4’ deep using a rubber 45 mil liner and placed a large piece of flagstone in the bottom of the pond for the fish to hide. 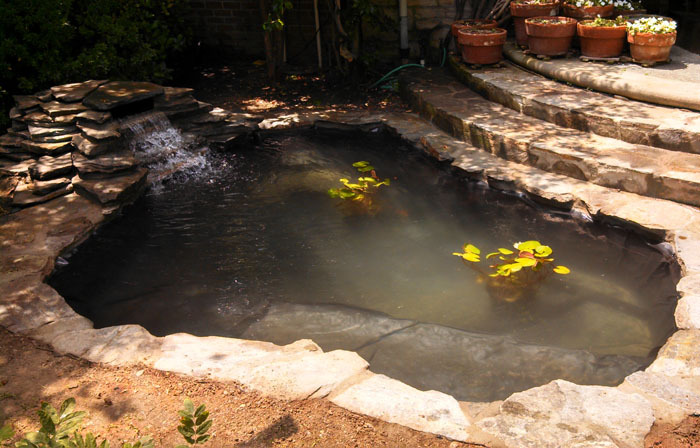 Next we made certain that the stone around the pond matched up with the stone on the steps, which was very close to the pond, and then to make pond maintenance easier, we installed a media filtration system, which we placed behind the plants in the corner of the yard. 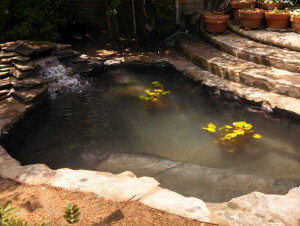 The media filter really help to pick up the debris off of the pond and flushing out or cleaning the pond is very simple. By using media in the filter vs. using sand as the media, we were able to install a more efficient motor to help in reducing energy costs.